The ABEC scale is an industry accepted standard for the tolerances of a ball bearing. It was developed by the Annular Bearing Engineering Committee (ABEC) of the American Bearing Manufacturers Association (ABMA). The ABEC scale is designed to provide bearing manufacturers dimensional specifications that meet the standards of precision bearings in a specified class. Manufacturers who produce equipment that require bearings must also know the dimensional tolerances to design parts that will accommodate a bearing. There are five classes from largest to smallest tolerances: 1, 3, 5, 7, 9. The higher ABEC classes provide better precision, efficiency, and the possibility of greater speed capabilities, but do not necessarily allow the components to spin faster. The ABEC rating does not specify many critical factors, such as load handling capabilities, ball precision, materials, material Rockwell hardness, degree of ball and raceway polishing, noise, vibration, and lubricant. Due to these factors, an ABEC 3 classified bearing could perform better than an ABEC 7 bearing. Bearings not conforming to at least ABEC 1 cannot be classified as precision bearings as their tolerances are too loose. For a graphical representation of the bearing tolerance differences by grade, please see the table. The table shows the actual allowable deviations, in micrometers (μm), from nominal for a 20 mm inner diameter bearing. 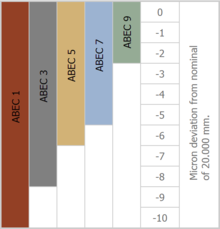 As you can see, an ABEC 7 bearing only has a 5 μm tolerance window, whereas an ABEC 1 has double that at 10 μm. Please see the tables and PDF's above for more specific precision bearing tolerancing. ^ ISO 492:2014 – Rolling bearings – Radial bearings – Geometrical product specifications (GPS) and tolerance values. Iso.org (2014-09). Retrieved on 2017-10-11. ^ Bearing Precision Comparison. Minibearings.com.au. Retrieved on 2012-08-12. This page was last edited on 12 December 2018, at 08:06 (UTC).